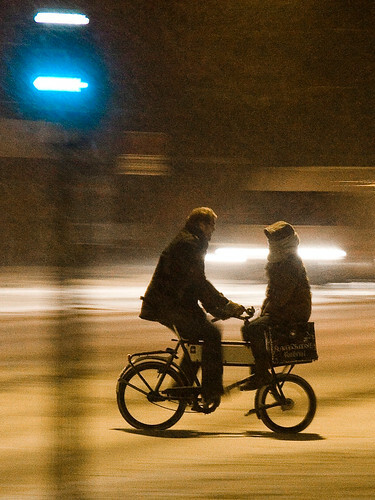 No silly snowstorm can stop you from enjoying a cosy face-to-face bicycle ride through the city. Addendum: The New York Times has compiled a list of 31 Places to Go in 2010 and Copenhagen features at number 5. Oddly squeezed between Mysore and the Trat Islands, but hey. They have their priorities right in citing our bicycles, bicycle infrastructure as well as Cycle Chic as damn good reasons to show up in "one of the world’s greenest — and maybe coolest — cities. Yay! That's my husband and me! how wonderful! you two were a vision of calm and grace on that snowstormy evening. send me a mail and I'll send you a hires version. if you were pedalling backwards, you may have reason to be nervous. but sitting calmly on a box is a different matter, don't you think? Also, trusting your companion with every fiber in your being helps!